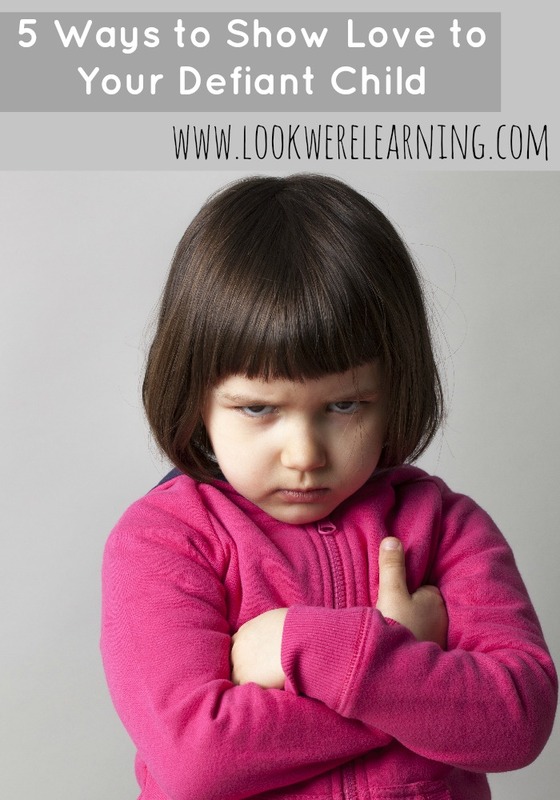 Confessions of a Fake Supermom - Look! We're Learning! Being a mom in the 21st century is pretty exhausting. It’s true that our mothers and our grandmothers had fewer modern conveniences than we did, but they also had much, much lower expectations. No one expected them to try to “do it all”. Yet, most of us moms live under that expectation EVERY. SINGLE. DAY. Personally, I get sick of it. And what’s worse is that people think I actually live up to it! Whenever I’m out with my kids, I get asked “How do you do it?” Friends ask me that. Family members ask me that. Even perfect strangers stop in the middle of Aisle 9 of the grocery store to ask me that! Well, here’s a newsflash: I don’t do it all, I’m not good at everything I do, and I’m not always a happy mama to my kids. In short, if you’re looking for a perfect mom to admire, then I have to confess: I’m a fake supermom! I do homeschool my children. I do work (both outside and inside the home). And I do work out. So if you’re just outside looking in, it can really seem like I’m doing “it all”. Well, I’m not. I use a lot of online homeschooling resources to ease the amount of time I spend teaching the kids. We also use a year-round school schedule that allows us to have school lessons three days a week only, which gives me a lot of flexibility. My employer is very understanding and allows me to get most of my work done from home virtually. Without that concession, there’s no way I could have a job outside the home. My online work is also flexible. If it weren’t, I wouldn’t be doing it. And I do work out, but not as much as I’d like to and not in the kinds of activities I’d like to. I wish I could attend gym classes regularly, lift weights more often, and take up more sports. But I just don’t have time for all of that. Maybe in a few years. If any of you have pictured me as an all-day homeschool teacher with two full-time jobs on the side who’s in perfect shape, I have to burst your bubble and tell you it’s not so. I’ve learned how to do some of everything I want to do. But I can’t do it all. No one can. 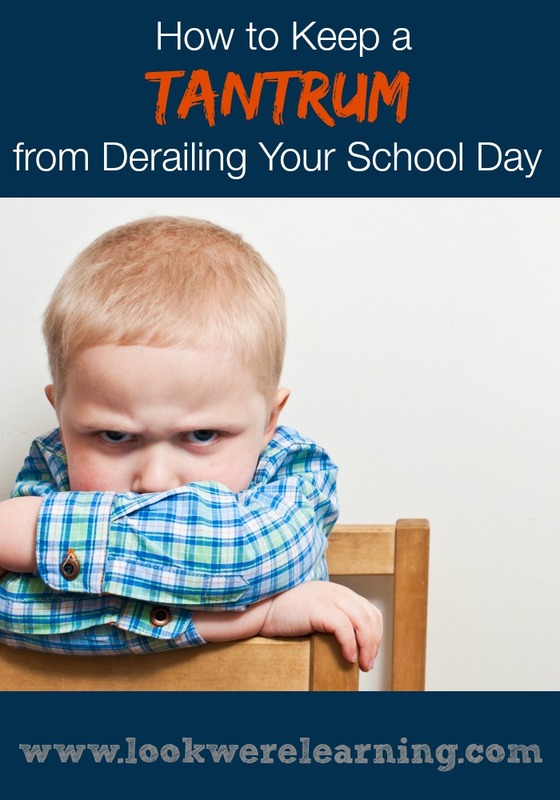 Subscribe to our newsletter for more ADHD parenting and homeschooling support! With all of these interests, I must be a jack of all trades, right? Wrong! I have ADD, which means that I get interested in all kinds of things. Almost on a monthly basis. And while that keeps my life interesting, it also makes it very difficult to stick with something long enough to truly master it. So I end up being kind of okay at a lot of things, but great at almost nothing. As I’ve gotten older, I’ve started to force myself to finish what I start, which has drastically reduced the number of interests I have. But I’m not good at everything I do and I may never be. Which is just fine. By nature, I’m a pretty sunny person. I tend to be positive and upbeat…for the most part. But parenting is hard, even when you’re a naturally happy soul. And there are days when I feel so sad I can barely stand to get up in the morning. I don’t talk about it a lot, because it doesn’t change anything and because I know it will pass. Complaining doesn’t help me much. 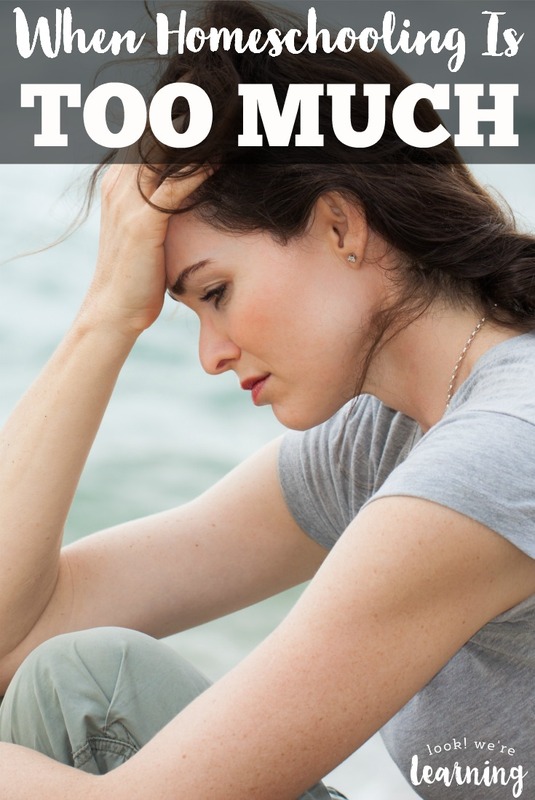 I still have to be a mom and I have to keep going, whether I feel like it or not. But the fact that I don’t vent a lot doesn’t mean I don’t struggle. I do. In fact, I think that might be something I talk about more on the blog. What do you think? 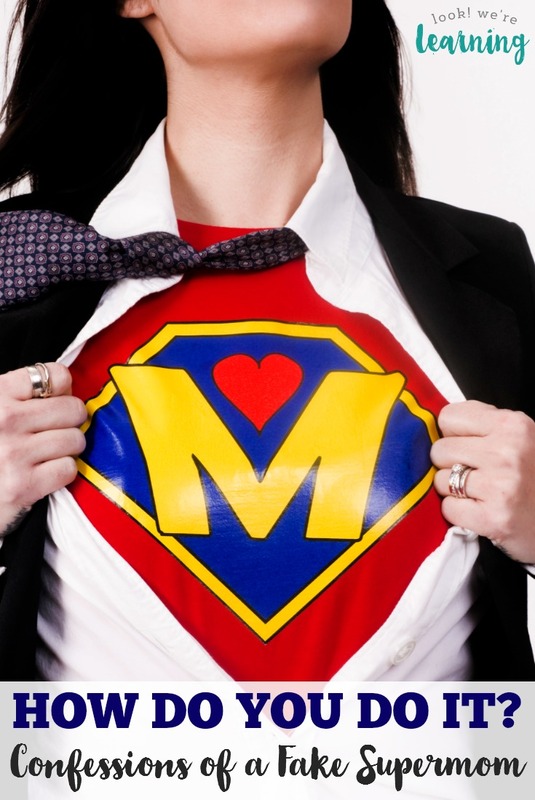 If you’ve been struggling trying to make yourself live up to some perfect image of a superwoman or supermom, let me reassure you of this: There are no supermoms. Every mother who looks like one isn’t really one. Which means you don’t have to try to be that either. 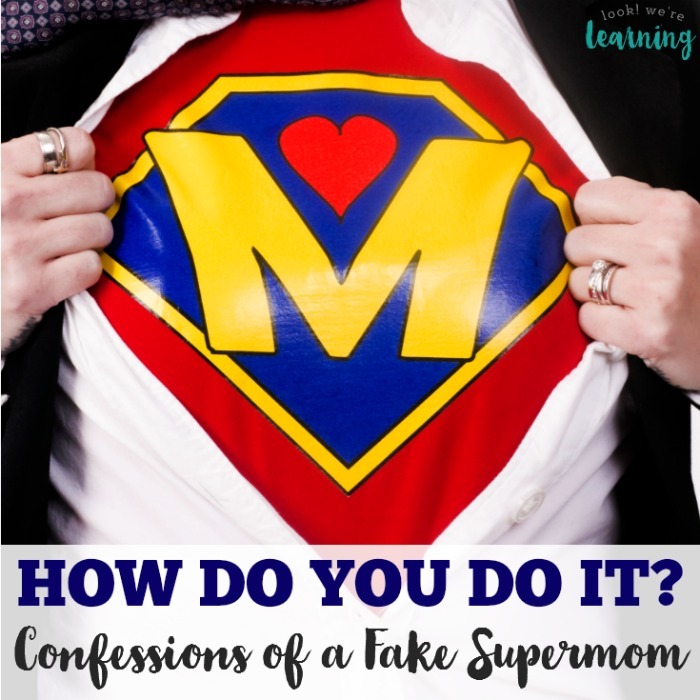 Take it from me: an honest-to-goodness fake supermom! Need more parenting tips for the real mom life? And get more support on my Parenting with Joy Pinterest board! Thank you for your timely post. Similar to you, I often get the same questions. I was blessed to earn a second master’s degree online, work on the weekends and eventually online and home school. I have a lot of days where I feel overwhelmed with it all. I wish I could get more exercise into my day, more sleep 🙂 I know that I am definitely a fake Supermom.